Well this seems short-sighted. 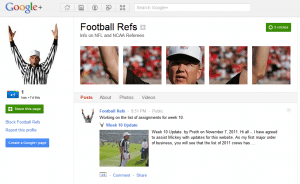 The NFL has decreed that all referees are not allowed to use any social media. My question: What exactly is social media? Sure, that includes Twitter and Facebook. What about text messaging? Only to other people? Not at all? Can they create an account on YouTube account to post comments? Digg? Google Reader has more and more social features, so does that count? The grayness of this gets confusing quickly and will only get worse. I can see what the NFL is trying to do, but they seem to be taking the wrong angle. Why not simply prohibit them from posting anything job-related? That seems fair and easy. Other items from this new policy block players from posting anything social from 90 minutes pre-game to after the post-game press conferences, and no internet sites may post anything that resembles play-by-play. Good luck with that.